On his way to work on the morning of March 9, Superintendent Scott Weidmark received a call from his 12 Division station where he’s the unit commander. Police were looking for a black Toyota Camry that was stolen from a driveway with a four-year-old girl inside. Detective Ranbir Dhillon and Sergeant Juan Quijada-Mancia, who was the abduction call incident commander, were already on the scene managing the case by the time Weidmark arrived at work. The vehicle was located three hours later with the girl safe inside, abandoned by the thief. A passer-by notified police. Specialized Emergency Response Police Dog Services Michael Quinn said Quijada-Mancia’s professionalism on the scene was impressive. “I was so impressed with Juan’s confidence and his ability to make knowledgeable and sensible decisions. When I arrived on the scene and learned what he had done and what was planned next, I knew right away that I could step back and monitor the search. He conducted the search perfectly and guidance from Search Management was minimal,” Quinn said. The Toronto Police Operations Centre also played a huge support role to find the abducted girl. The media broadcasted the information of the Amber Alert steadily throughout the morning, alerting the public about the vehicle and child's description. 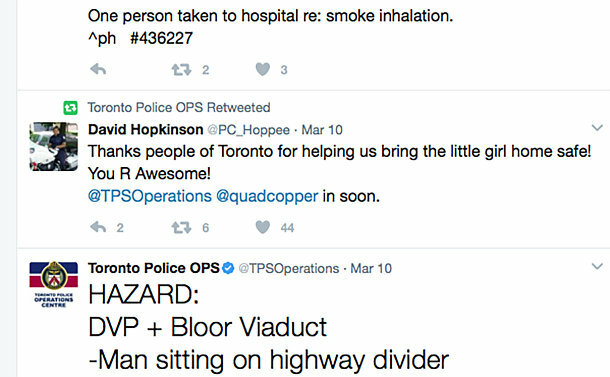 TPOC also ensured surrounding Greater Toronto policing agencies were notified about the missing child, as well as Canada Border Services Agency. Ferguson said beyond social media, the Amber Alert was also pushed as a notification on the TPS mobile app.